02:26 — Carrie Fisher: DEAD! 05:36 — Doctor Who: The Pirate Planet book launch. 07:30 — Star Wars: Additional cast for Han Solo film. 09:20 — Mark Hamill: Jokers Trump’s tweets. 10:09 — Star Wars: Official Shapeways 3D printing for Disney properties. 12:56 — Star Trek: Axanar fan film fails in court. 15:30 — DC TV Series: The CW renews Supergirl, The Flash, Arrow and Legends of Tomorrow. 16:56 – Doctor Who: The Power of the Daleks. 31:50 – Flotsam and Jetsam. 45:40 – Passengers (2016 film). 60:28 – Emails and listener feedback. 76:57 – Farewell for this podcast! 78:49 — End theme, disclaimer, copyright, etc. Wikipedia: Doctor Who – The Power of the Daleks. BBC: Doctor Who – The Power of the Daleks. YouTube: The Sewer King – Seven Wonders Of The Industrial World. 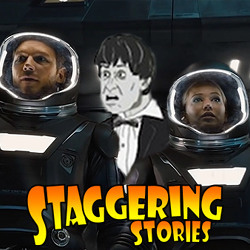 This entry was posted on Sunday, January 15th, 2017 at 10:00 and is filed under Doctor Who, Film, Passengers, podcast, review, Sci-Fi, staggering stories, Staggering Stories Podcast, Staggering Stories Regular Podcast, tv. You can follow any responses to this entry through the RSS 2.0 feed. You can leave a response, or trackback from your own site.